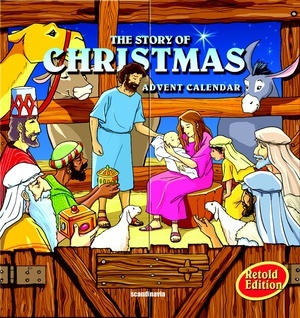 The 13-3/4" x 14-1/4" Christmas calendar opens to reveal 25 small board books. Each book has 10 pages and measures 1-1/2" x 2". A silver string is attached to the spine of each book. With daily readings, the 25 books unfold the story of Christmas as told in the Gospels. The mission statement of Swanson Christian Products is to develop, manufacture, import, market and export Christian products internationally which help point people to God in their daily lives. Our efforts are supported through ministry partnerships and evangelistic opportunities. They adhere to Christian principles with their customers and employees, and operate under biblical financial statements. They strive to seek God in their personal and business decisions.